Welcome to Community Gardens at Cornell! We are a Cornell University-associated community garden club. Membership is open to anyone in the Ithaca community. The Community Garden Plots are located on Freese Road between Hanshaw and Dryden Roads. All of our members must complete a "Best Gardening Practices" gardening class provided by Cornell Cooperative Extension. We may experiment with an online course this year. Details to come. Gardening can begin after the fields are plowed and plots are marked. Usually early-mid May, although very wet weather can delay our access to the gardens. Gardens must be cleared by a date in early-mid October immediately followed by a volunteer clean-up effort so that the the fields can be prepared for the next season. Fields are plowed each fall and disked each spring by Cornell Farm Services. We rotate gardening between the north and the south fields every two years. The 2019 season is our second season in the north field. The other field is cover cropped with winter rye in the fall, interseeded with clover in the spring and mowed in the late summer of the first fallow year. The clover remains as cover for year two and is incorporated back into the soil at the end of year two. 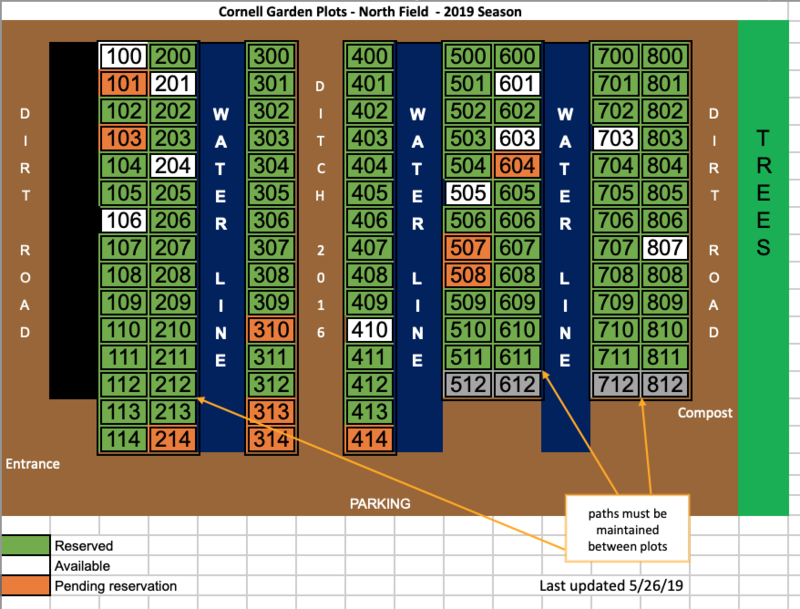 20 x 25 ft. plots are $30 for the 2019 growing season. Compost and water are included. Thanks to all of a gardener-volunteers who help us mark plots in the spring, clean up in the fall and report water leaks or other concerns. Special thanks to those who manage the extensive water distribution infrastructure, navigate our relationship with Cornell, handle finances and communications, and coordinate deliveries to the Food Donation Network. The Cornell Campus Activities Office coordinates all Cornell-associated Clubs and the Cornell real estate department provides support for our license to use the land. Cornell Farm Services provides all of the plowing, mowing, compost delivery and cover crop services. Our water access is provided by Bolton Point via metered access to a nearby hydrant. The Cornell College of Agriculture and Life Sciences (CALS) has worked with us extensively to work out appropriate rules and expectations for our activities as stewards of the land. To join the lists, send an email message FROM the email address where you want to receive messages posted to the e-list. Leave the body of the message blank.